Welcome to 'Fine Lines', the Friday feature in which we give a sentimental, sometimes-critical, far more wizened look at the children's and YA books we loved in our youth. 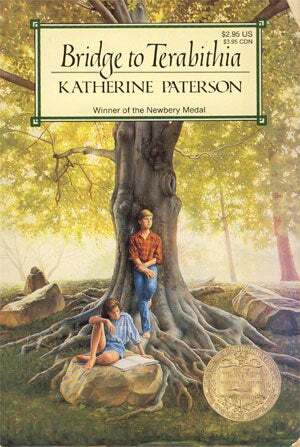 This week, writer / reviewer / blogger Lizzie Skurnick reads Katherine Paterson's 1977 book 'Bridge to Terabithia', the story of Jess Aarons, the second-fastest runner in the fifth grade. Jess watched his dad stop the truck, lean over to unlatch the door, so May Belle could climb in. He turned away. Durn lucky kid. She could run after him and grab him and kiss him. It made Jess ache inside to watch his dad grab the little ones to his shoulder, or lean down and hug them. It seemed to him that he had been thought too big for that since the day he was born. "If you're so afraid of the cow, why don't you just climb the fence?" "Gary stopped walking and wheeled to face him. Fulcher glared first at Jess and then at Leslie Burke. "Next thing," he said, his voice dripping with sarcasm, "next thing you're gonna want to let some girl run." Jess's face went hot. "Sure," he said recklessly. "Why not?" He turned deliberately toward Leslie. "Wanna run?" he asked. ....For a minute he thought Gary was going to sock him, and he stiffened. He mustn't let Fulcher suspect he was scared of a little belt in the mouth. But instead Gary broke into a trot and started bosses the threes into line for their heat....See, he told himself, you can stand up to a creep like Fulcher. No sweat. Caught in the pure delight of it, Jess turned and his eyes met Leslie's. He smiled at her. What the heck. There wasn't any reason he couldn't. What was he scared of anyhow? Lord. Sometimes he acted like the original yellow-belled sapsucker....He felt there in the teachers' room that it was the beginning of a new season in his life, and he chose deliberately to make it so. There were parts of the woods that Jess did not like. Dark places where it was almost like being under water, but he didn't say so .... Jess agreed quickly, relieved there was no need to plunge deeper into the woods. He would take her there, of course, for he wasn't such a coward that he would mind a little exploring now and then further in amongst the ever-darkening columns of the tall pins. But as a regular thing, as a permanent place, this is where he would choose to be... ... there in the shadowy light of the stronghold everything seemed possible. Between the two of them they owned the world and no enemy, Gary Fulcher, Wanda Kay Moore, Janice Avery, Jess's own fears and insuffiencies, nor any of the foes whom Leslie imagined attacking Terabithia, could ever really defeat them. Leslie's parents were young, with straight white teeth and lots of hair-both of them. Leslie called them Judy and Bill, which bothered Jess more than he wanted it to. It was none of his business what Leslie called her parents. But he just couldn't get used to it. Both of the Burkes were writers. Mrs. Burke wrote novels and, according to Leslie, was more famous than Mr. Burke, who wrote about politics. It was really something to see the shelf that had their books on it. Mrs. Burke was "Judith Hancock" on the cover, which thre you at first, but then if you looked on the back, there was her picture looking very young and serious. Mr. Burke was going back and forth to Washington to finish a book he was working on with someone else, but he had promised Leslie that after Christmas he would stay home and fix up the house and plant his gaden and listen to music and read books out loud and write only in his spare time. They didn't look like Jess's idea of rich, but even he could tell that the jeans they wore had not come off the counter at Newberry's. There was no TV at the Burkes', but there were mountains of records and a stereo set that looked like something off Star Trek. And although their car was small and dusty, it was Italian and looked expensive too. They were always nice to Jess when he went over, but then they would suddenly begin talking about French politics or string quartets (which at first he thought was a square box made of string), or how to save timber wolves or redwoods or singing whales, and he was scared to open his mouth and show once and for all how dumb he was. He thought about it all day, how before Leslie came, he had been a nothing—a stupid, weird kid who drew funny pictures and chased around a cow field trying to act big—trying to hid a whole mob of foolish little fears running wild in his gut. Leslie was more than his friend. She was his other, more exciting self-his way to Terabithia and all the worlds beyond. But Jess has also learned something very important — that Leslie was scared too. Rescuing his sister May Belle from the same river in which Leslie drowned, he forgives himself for not saving Leslie and for being too cowardly to be there for her the day she died. Everybody gets scared sometimes, May Belle. You don't have to be ashamed." He saw a flash of Leslie's eyes as she was going in to the girls' room to see Janice Avery. "Everybody gets scared."